IÖGO Probio Blackberry-Blueberry probiotic yogurt. Pretty tub, really. The yogurt section of any large grocery store is more daunting than the wall of toothbrushes in the pharmacy. They’re all somehow yogurt, but every one claims to be different in some way, and invariably better than all the others. It’s the dairy-case equivalent of every striving, scrabbling rapper’s ghetto-dream assertions that they, truly, are better than all the otha sucka MCs. If you get lost in a low-fat, no-fat, full-fat, sucralose-dosed, real sugar, lactose-free hellish wealth of choice that you mostly can’t win, here’s my trick: pick a few criteria, then filter out anything that doesn’t match. Prioritize, young man, prioritize. Zero-fat yogurt is a non-starter for me. At the very least, some fat is required to make a yogurt respectable. Eating fat-free yogurt feels like eating Jell-O with calcium. The sweetener is also key. The worst are yogurts that rely completely on an artificial sweetener to keep calories ultra-low (these are often the zero-fat types, too). I try for at least some sugar in the mix. I’m flexible with flavours, so it comes in third on my list of priorities. Go figure. I love blackberry, blueberry, lemon, peach, strawberry, and others down the list in descending order. 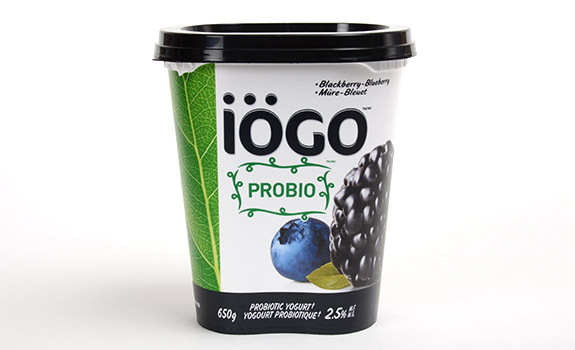 Meeting all of these criteria, I introduce to you IOGO’s Probio Blackberry-Blueberry Probiotic Yogurt. The milk-fat level is a reasonable 2.5 %, the sweetener is sugar (no artificial sweeteners in here at all, amazingly) and the flavour features a combo of two of my favourite berries. The Look: Pretty graphics, like the rest of the IOGO line. Sadly, this makes it hard to distinguish it from all the other IOGO products in the dairy aisle. The yogurt is a pastel purple shade, and there are plenty of large chunks of fruit (whole berries, even) stirred into it. The Taste: Delicious. The blueberry and blackberry flavours are there, but they combine into something not unlike a mellower, less aggressive form of blackcurrant. Creamy, thick texture without being overly fatty or rich. Satisfying sweet/tart profile, with ripe berry taste – including crunchy blackberry seeds. Not at all chalky, thin or gelatinous. 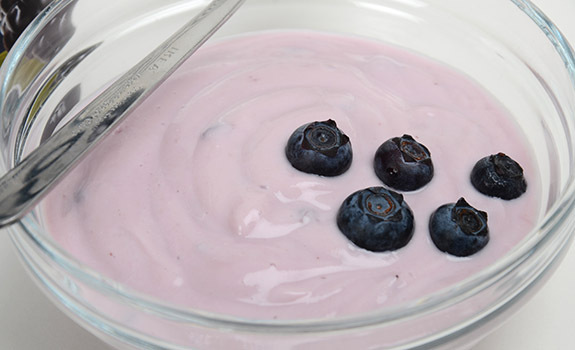 A bowl containing 176 grams of IÖGO Probio Blackberry-Blueberry probiotic yogurt, with a few blueberries as garnish. Yum! Cost: $3.99 for a 650 g tub at Safeway in Calgary. Availability: Not universally available. I can’t find it at my Calgary Co-op, but it’s easy to find at Safeway. Nutrition? : Per 3/4 cup (175 grams): 170 calories, 4.5 grams of fat, 85 mg of sodium, 0 grams of fibre, 6 grams of protein. Also, 20% daily value of both vitamin D and calcium. The verdict: Excellent. The right balance of delicious and healthy. Any compromises made here are the right ones.